The researchers collected county-by-county data on coyote arrival by assessing museum collections and deer population numbers by tracking hunting records from state wildlife agencies. They evaluated these data for changes in the number of deer harvested after coyote arrival and establishment in an area, while accounting for environmental differences like climate and landscape. They found that the number of harvested deer in all states generally increased over time, and that there was no consistent crash in harvest numbers following coyote arrival. They concluded that coyotes are not controlling deer populations at a large region-wide scale in eastern North America. The paper, “No region-wide effects on white-tailed deer following eastern coyote colonization,” is published in the Journal of Wildlife Management and Wildlife Monographs. Allison Hody, Christopher Moorman and Christopher Deperno from NC State, as well as L. Scott Mills from the University of Montana, co-authored the research. The work was done with support from the Fisheries, Wildlife and Conservation Biology Program at NC State. A coyote captured on camera trap preying on a deer fawn. Credit: Dr. Aimee P. Rockhill (Western Carolina University) and Dr. Christopher S. DePerno (North Carolina State University). Abstract: The expansion or recovery of predators can have dramatic effects on local prey populations. 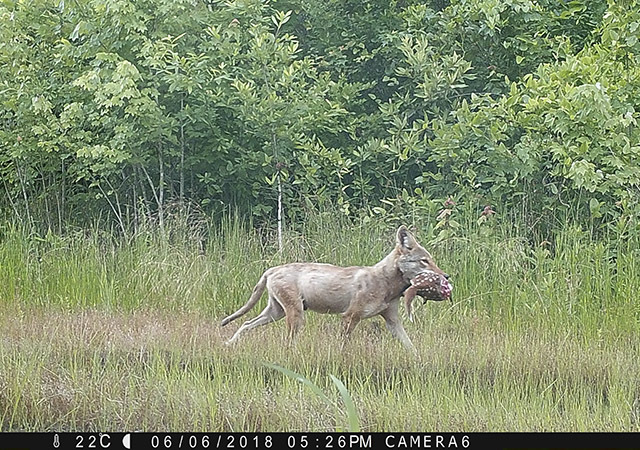 Since the 1940s, coyotes (Canis latrans) have expanded into eastern North America where they are now the largest predator and will prey on white-tailed deer (Odocoileus virginianus). However, their effect on deer populations remains controversial. We tested the hypothesis that coyotes, as a novel predator, would affect deer population dynamics across large spatial scales, and the strongest effects would occur after a time lag following initial coyote colonization that allows for the predator populations to grow. We evaluated deer population trends from 1954 to 1996 in 384 counties of 6 eastern states with linear mixed models. We included deer harvest data as a proxy for deer relative abundance, years since coyote arrival in a county as a proxy of coyote abundance, and landscape and climate covariates to account for environmental effects. Overall, deer populations in all states experienced positive population growth following coyote arrival. Time since coyote arrival was not a significant predictor in any deer population models and our results indicate that coyotes are not controlling deer populations at a large spatial scale in eastern North America.